Yaskawa Electric Corporation (Representative Director and President: Hiroshi Ogasawara) is pleased to announce that as of June 5, it has started sales of the collaborative robot MOTOMAN-HC10 (payload: 10 kg), a new addition to the MOTOMAN lineup of industrial robots. The MOTOMAN-HC10 can work with humans without the need for a safety fence, which will expand the potential for its use in a broad range of general industrial areas including automobile. While conventional industrial robots have been used chiefly in the automobile industry, Yaskawa is also aiming to accelerate automation and labor-saving through the use of robots in the consumer electronics industries as well. Yaskawa will realize new ways of manufacturing through collaborations between people and robots MOTOMAN-HC10 compliant with the international standards of ISO10218-1 and requiring no safety fences. MOTOMAN-HC10 does not require a safety fence to be set up*. It is equipped with a mode for collaborating with humans that stops operation automatically when external force is detected that exceeds the limitation on values which are set in advance. Its arm is designed in a shape that prevents people’s hands from being stuck or pinched, which will improve the flexibilities for production equipment. This design will expand the potential for automation through the use of robots at sites that had previously foregone their introduction or in processes where it had been difficult for robots to be set up. *Risk assessment is needed when using the robot without a safety fence. 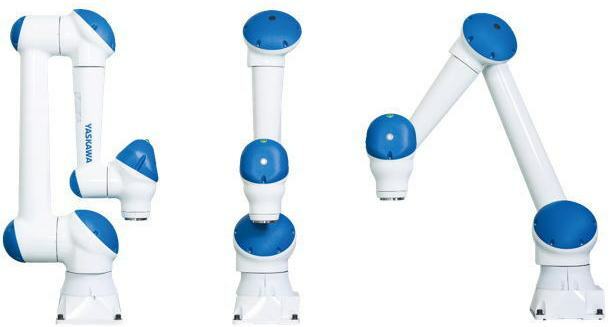 In addition to conventional teaching methods which use a programming pendant, the robot is equipped with a direct teaching feature where the arm of the robot may be held by hand, operated as desired, and instructed to perform selected actions. As instructions are possible through intuitive manipulation, the robot will be easy to introduce to customers who are not accustomed to robotic operations and for processes that require frequent instructions.